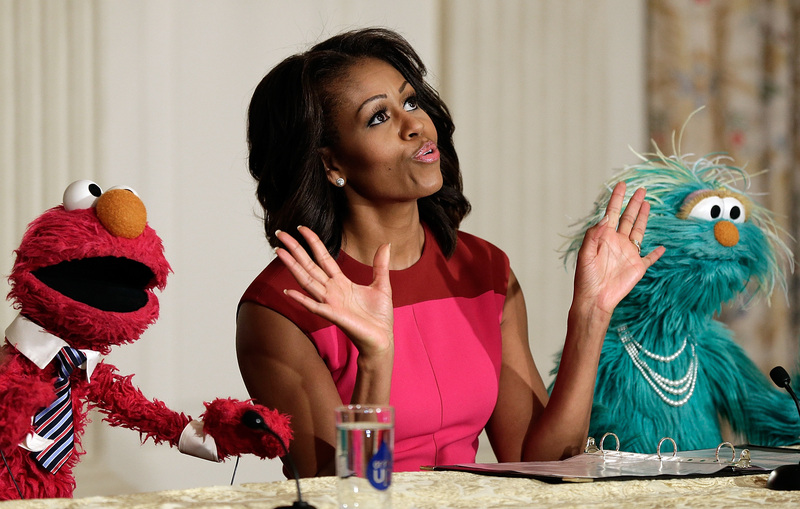 Michelle Obama knows how to start a fashion craze or controversy in the blink of an eye. Not only did her husband start his term in the middle of the worst economic downturn in years, but today's public figures are more scrutinized than ever thanks to a perpetual army of paparazzi and lightning-quick social media. But over the course of President Obama's two terms, the FLOTUS has taught us a thing or two about style with the way she handles media mishaps and economic obstacles, changing the way we think about fashion and dressing gracefully for any occasion. In the age of overactive paparazzi, Obama’s look has been documented every time she steps outside the White House, even for a quick jaunt around the White House Lawn. And in the midst of such economically uncertain times, Obama’s look has to strike a constant balance between fashion-forward and socially conscious. Not an easy feat for someone whose daily ensembles are analyzed for their cost, appropriateness, and general polish. CFDA believes in promoting American fashion… so we were surprised and a little disappointed not to be represented for this major state dinner. However, the First Lady typically pays close attention to her public image and the issues at hand when dressing for public events. Over the past several years, Ms. Obama has made a habit of commissioning gowns from little-known American designers in hopes of propelling them to success. Since the First Lady wore up-and-coming designer Jason Wu to not one but two inaugural balls, the designer has become a household name whose brand is synonymous with classic elegance and luxury. Likewise, several public outings in ensembles by Prabal Gurung in 2010 and 2011 propelled the new designer to major notoriety. Great designers design with mankind in mind…the crossroads of science and art, innovation and inspiration are what I love about design. Obama's mix of domestic and international brands may land the First Lady in hot water occasionally, but is an ultimately diplomatic move which celebrates a globalized view of fashion. In light of the ailing economy when President Obama first took office in 2009, all eyes were on the First Lady to see how she would handle the recession sartorially. Though certain choices have been criticized as extravagant and insensitive to economic conditions (that gorgeous beaded J. Mendel jacket from July 2013 cost $6,800), the majority of Obama's wardrobe is in fact from mid-price brands such as Talbot's and J. Crew. And the First Lady's favorite dresses are often recycled several times in hopes of trimming wardrobe costs. The Harvard Business Review published a study in November 2010 on the effect of Obama's clothing choices on stock values for clothing companies; unsurprisingly, those brands which Obama wore to public appearances immediately skyrocketed in stock value. In an age when new clothing isn't accessible to all, the First Lady demonstrated to the country how to be a recessionista. However, one of the media's greatest concerns with the First Lady is the fact that her fashionable exploits tend to detract attention from political concerns. After all, this is a First Lady whose bangs nearly stole the show from her newly reelected husband. The latest on the list is a broadcast media slip-up which actually has very little to do with Ms. Obama herself, and everything to do with how CBS This Morning edited their January 14 show. Newsbusters reported that while CBS newscasters spent a whopping four minutes chatting about Obama's two inaugural dresses on display at the Smithsonian, barely one and a half minutes were spent discussing Obamacare. The so-called transgression comes on the heels of the controversy surrounding the Michelle Obama's April 2013 Vogue cover, which prompted the American people to ask if precious time and resources should be spent glamorizing Obama when the economy still needed a serious boost. However, the First Lady is foremost a public figure, and one of her primary roles is to bolster public confidence in whatever way possible. Choosing to reach out to the public by conducting interviews with major media outlets such as Vogue and People magazine not only makes the FLOTUS more accessible to the public, but also highlights her preppy, fun sense of style. First and foremost, I wear what I love. That's what women have to focus on: what makes them happy and what makes them feel comfortable and beautiful. If I can have any impact, I want women to feel good about themselves and have fun with fashion. Fashion is about enjoyment, and a little criticism now and then simply means you're doing something right.